A pair of swans has been nesting beside a bridge over the Grand Union Canal close to our house. On Thursday last week I noticed that the little grey balls of fluff had hatched. On Friday en route to a pub lunch I went armed with a camera but, to my surprise, the family had swum the nest. That was quick. Today we took our cameras on a more serious search looking along the canal towards town. Finally we found them, both parents and eight cygnets, just before a lock about a mile “upstream”. They seemed unconcerned as we began clicking away, perhaps because their nest had been adjacent to a car park where admirers frequently gathered. Whilst people seemed to cause the swans little concern, ducks were another issue. 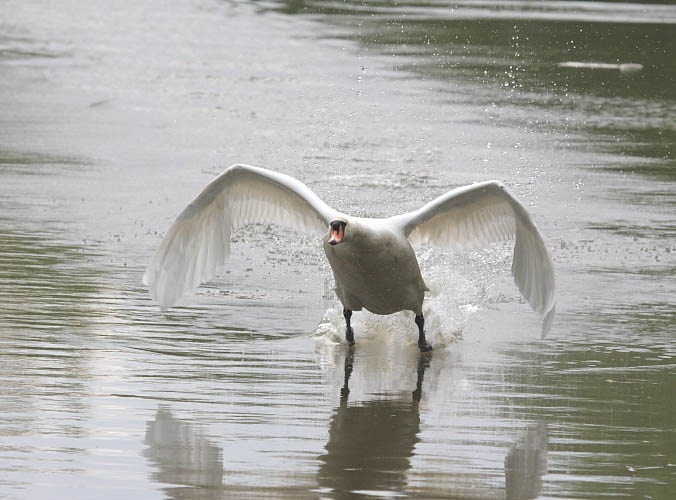 There was an explosion of activity as the cob suddenly got in a flap over a mallard’s proximity, took to the wing and chased it back along the canal skimming the water all the way. 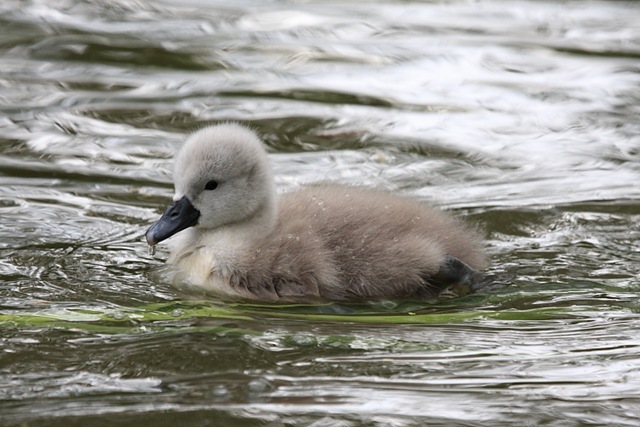 With father absent, the pen and cygnets continued swimming around apparently unconcerned. 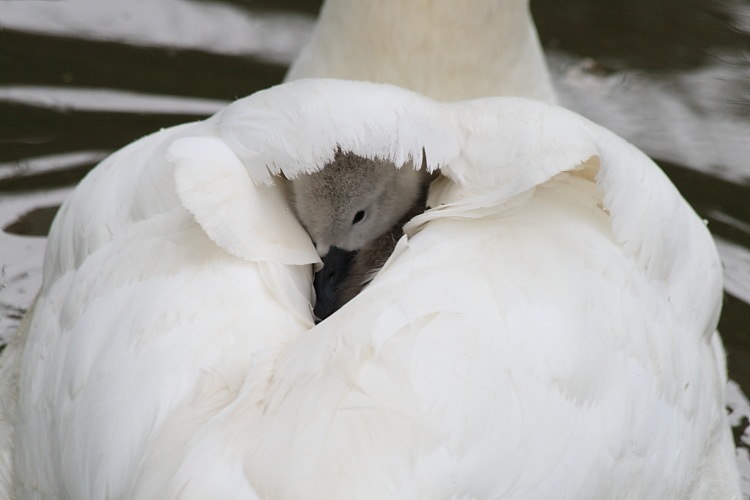 We watched fascinated as a couple of the cygnets began scrambling up onto mother’s back and nestled down to hitch a ride between her wings. This is not behaviour that we’d ever witnessed before in swans though we had seen a grebe chick riding on a parent’s back. Sometimes the cygnets seemed to be sheltering but occasionally one or two heads would pop out to look around. 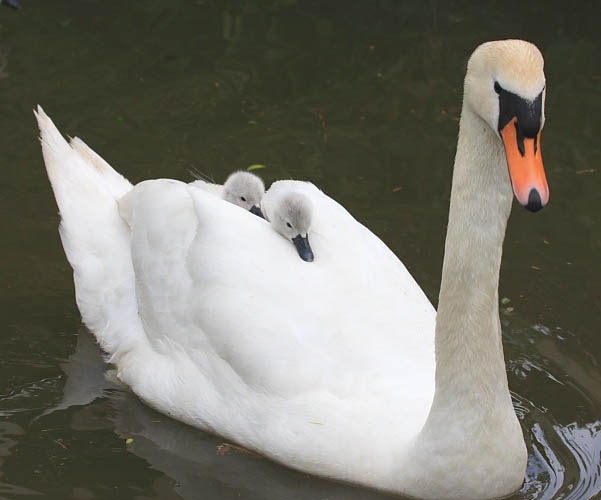 Naturally, given the fluffy subjects, two cygnets riding pillion on their graceful mother’s back was an endearing site. Father eventually returned in shower of water droplets having left the mallard in no doubt that its presence was not appreciated. Ya just gotta love wildlife.